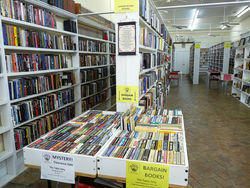 Named after a 1957 jazz record by John Coltrane, Blue Train Books is a quality used bookstore located in small town destination Hogansville, GA. Our store is filled with clean, affordable, well organized used books, with some collectible and signed editions. Online, we handle only a select inventory of our more scarce and specialized items. Our online and store inventory does not overlap. In our listings, we strive to provide detailed and faithful descriptions so that the buyer may find the item that most closely matches what they are looking for in terms of condition and price. All items are listed, packed, and shipped by the business owner, who is himself a book collector. All items, even common editions, are stored, handled, and packed for shipping as if they are collectibles. Inquiries welcome.